Chamonix (or Chamonix-Mont-Blanc) is a French town of some 10'000 inhabitants located at the foot of Mont Blanc in Haute-Savoie (eastern France), bordering Switzerland and Italy. It held the first Winter Olympics in 1924 and is often considered the world capital for mountain sports. Its unique scenery includes the Mer de Glace (Sea of Ice), the Vallee Blanche (White Valley) and the Aiguille du Midi. It is a great place for photo and movie productions such as James Bond's "The World Is Not Enough" (1999). The Chamonix commune includes a number of villages stretched out along the valley, such as Les Bossons, Les Praz, Argentière and Le Tour. It is connected to the French highway network through a 2x2 road, to Switzerland (Martigny) via the Montets pass and to Italy (Courmayeur) through the Mont Blanc tunnel (11.6 km). The closest airport is in Geneva, less than 1 hour drive away. Goods, production teams, photographic equipment and models can therefore be moved to and from Chamonix easily for photo productions. 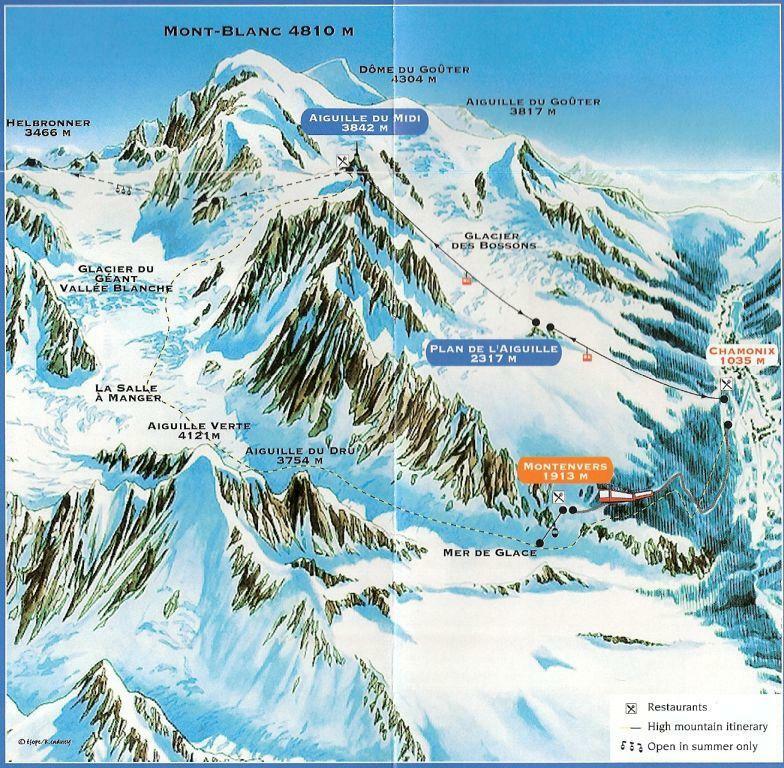 With its 4,810m summit, the Mont-Blanc is the highest mountain is the Alps and Western Europe (west of the Caucasus in Russia). The Mont Blanc Massif lies between the regions of Aosta Valley (Italy) and Haute-Savoie (France). It is the 3rd most visited natural site in the world. The Aiguille du Midi (3842m) is the highest of the Chamonix Aiguilles. It is accessible by the highest vertical ascent cable car in the world (from 1035m to 3842m) and offers 360° viewsight over the French, Italian and Swiss Alps, including the Mattherhorn (Cervin), Monta Rosa (Mont Rose), the Chamonix Aiguilles, the Grandes Jorasses, the Aiguille Verte, the Drus, the Dôme du Goûter and of course the Mont-Blanc. See also Mannequin Marseille, Mannequin Paris, Photographes Paris and Photographes Genève. You may want to visit our partner in art estimation .